For Kirk Palmer, defining jazz is pretty straight forward. 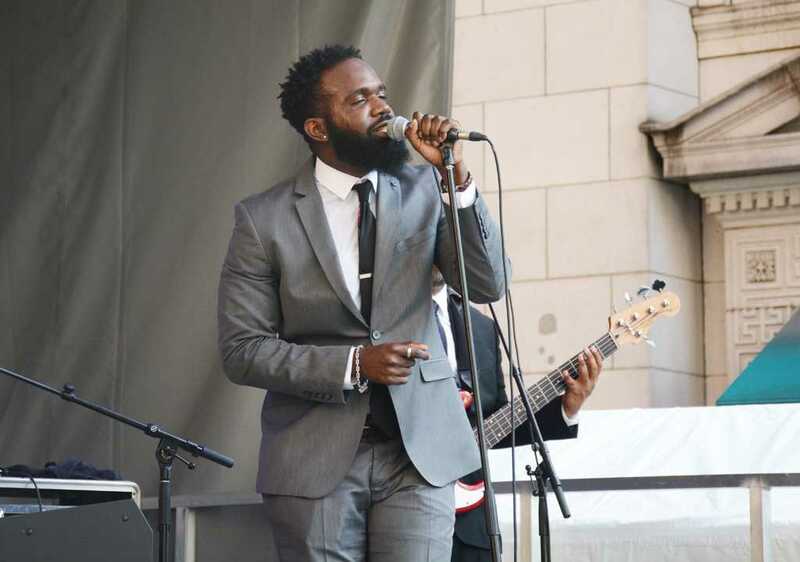 “It’s all about expressing yourself,” the Highland Park resident said, as the sound of keyboard, bass and saxophone swirled around him at the Pittsburgh JazzLive International Festival. Organized by the Pittsburgh Cultural Trust, the festival included both inside and outside events, Friday through Sunday. Three main stages along Penn Avenue hosted 16 free acts in total, while the August Wilson Center just up the street hosted three ticketed concerts Saturday night. Palmer attended the festival on Friday. While the feel of the festival’s Sunday segment was similarly pleasant, the same could not be said of the weather. Sitting in fold-out chairs, attendees watched the live acts through high temperatures and heavy humidity. Despite the brutal conditions, attendees like Lynette Hathaway were excited. “I thought [Aaron Abernathy and the Nat Turner Band] were fantastic,” Hathaway said excitedly, throwing her arms wide as she and her friend Robin Douglas packed their belongings. With lively bass work and thrashing percussion, the band moved through a set that had many members of the crowd working their way to the front of the stage to dance. Others settled for just wiggling and clapping in their seats. While the heat might have sapped some of their desire to groove, the crowd still gave a standing ovation. It had been Douglas’ idea to attend the festival, and Hathaway had never heard of Abernathy or his backing band before. But the group’s energetic performance — spent strutting the stage in suits — and sound reminiscent of ’60s pop and soul convinced Hathaway to turn her cheering into a more material appreciation. Earlier in the afternoon, fans sat at small tables for the nearby Sharp Edge Bistro to hear the Latin-tinged sound of Kenia and Antonio Adolfo on the UPMC Stage, situated on the north end of Penn Avenue. Tall row houses cast thin shadows while the Brazilian group played through old songs and new ones from an upcoming record. Kenia, the lead singer, switched from Portuguese to English lyrics throughout the performance. If attendees weren’t happy with the variety of live music present, a tent selling records gave them an opportunity to peruse the genre they craved. Also present were vendors selling crafts and Italian ice, while food trucks hawked hot dogs. It was far more than the sun and stands that brought Pittsburghers out, though. For Kenny Chen, at the show with his friend Michelle Flynn, the show highlighted the difference between his classical training and the music around him. Flynn, who trains with Pittsburgh singer Etta Cox, saw the same theme from her time in jazz. “[Jazz] is more of a canvas on which people interact,” she said. Palmer, also a jazz vocalist, agreed, and feels those interactions are what makes jazz the special American art form it has become. “I find that freedom to express deeply inspiring in my own life,” Palmer said.